Nets coach wants to see his squad bounce back from tough road losses. 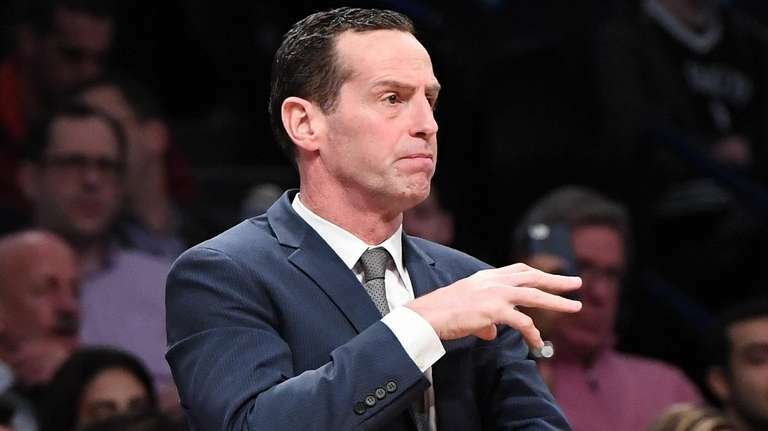 Brooklyn Nets head coach Kenny Atkinson gestures during the second half against the Detroit Pistons at Barclays Center on March 11, 2019. LOS ANGELES — There is no rest for the weary Nets. Less than 24 hours after they were blown out in Utah to drop to 0-2 at the start of their arduous seven-game road trip, the Nets were scheduled to face the rugged Clippers Sunday night at Staples Center. The Nets’ offense struggled badly in the first two games of their West Coast trip against Thunder center Steven Adams and Jazz center Rudy Gobert, two of the best rim protectors in the NBA. They didn’t figure to have that same problem against young Clippers center Ivica Zubac, but the Clips are solidly in eighth place in the Western Conference and have a veteran core that includes high-scoring Lou Williams and Montrezl Harrell off the bench. Asked how he hoped his team might bounce back, Nets coach Kenny Atkinson said, “Let’s not overreact. They took it to us pretty good. Against Utah, Atkinson faulted his players for allowing poor shooting to cause them to lose focus on defense, especially in transition. The Nets’ opponents are grabbing rebounds and getting back downcourt quickly against a dispirited defense. Atkinson even showed clips of their breakdowns at halftime in Utah. The Nets are at their best when they are shooting well, and on a deep roster, they have numerous scoring threats. But since the All-Star break, their offensive efficiency has nose-dived to third-worst in the league in that span. Clearly, point guards D’Angelo Russell and Spencer Dinwiddie lately have taken more of the burden on themselves, totaling 41 shots attempts at Utah. Much of their success comes from driving to the rim to get their own shots or kicking the ball to open shooters. Against Adams and Gobert, Russell and Dinwiddie too often tried to go over the top with difficult shots rather than pass to the open man for better shots. In a certain sense, their opponents were baiting them to drive or settle for mid-range shots, knowing the Nets’ three-point shooters have been slumping. It took a group effort for the Nets to overcome season-long adversity to reach seventh place in the Eastern Conference, and that’s what it will take to maintain their position down the stretch. “Collectively, we’re just not playing well right now offensively,” Atkinson said. “It’s a period we’ve got to get through.